Audrey Hepburn. James Dean. Elizabeth Taylor. Iconic American photographer Sid Avery photographed them all, many of the shots taken with his Hasselblad 500C. Known for capturing the stars of Hollywood’s golden age, Sid showed another side of these celebrities in a candid, intimate way. Born on 12 October 1918, his centennial year is celebrated on 12 October 2018, commemorating his contributions to the art of photography and the preservation of Hollywood history through the lens of his camera. Raised in Los Angeles, California where he was mentored by his uncle Max Tatch, a landscape photographer, Sid learned the ins and outs of photography and the darkroom processes. While working at Morgan's Camera store on Sunset Boulevard in the heart of Hollywood, where many big-time photographers came by, Sid studied the craft by night at Art Center. This was followed by a position as a darkroom assistant. Finally, he opened his own studio shooting portraits of female theatre dancers. Sid was then shipped out to Europe during Word War II where he ran the US army's photography division. Returning to Hollywood during its golden era, Sid became the celebrity photographer of choice during the 40s and 50s. Elizabeth Taylor sunning herself while on location in Marfa, Texas for the film "Giant"
Being invited to their homes or simply catching them off guard in between filming scenes, Sid captured a side of Hollywood stars that no one had ever seen before. Thanks to his genuine, friendly nature that made his subjects feel at ease, he was able to show the public the private side of the biggest names in the entertainment industry. Sid Avery passed away on 1 July 2002. He was 83 years old. 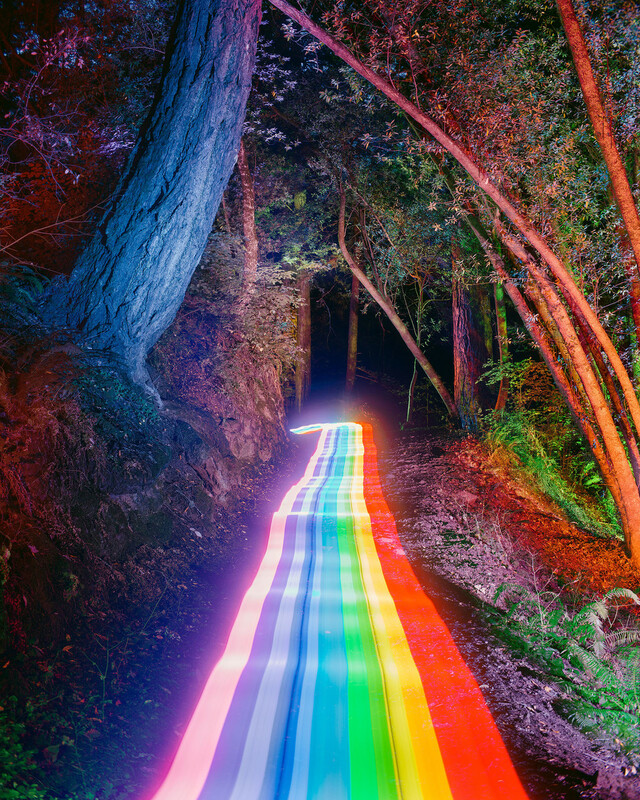 Inspired by the cold blue evenings of his New England hometown, Daniel Mercadante decided to experiment with rainbow lights and long exposure. The results: The Rainbow Road series.